What Patsy Means To Me. At 13 years old people are always surprised and shocked that your a Patsy Cline fan. People always say "Shoudnt you be listening to rap or something?" I don't see why age should mean you have no taste in music and as a Patsy Cline fan I consider Patsy Cline the BEST taste in music. 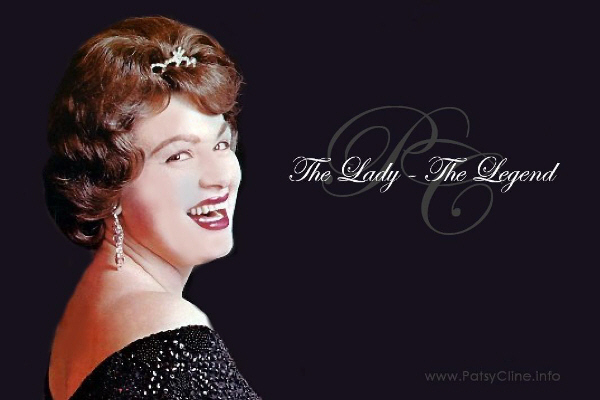 I had always known who Patsy was, she was the first female singer I ever heard! "Walkin After Midnight" was the first song I learned to sing. I used to get up on our kitchen counter and blare Patsy and sing to my hearts content. But, as many of you have also said, I started to grow up and as I did I left Patsy behind. Then when I was at the beach with some friends, a friend of mine got up and sang karoke at a diner. As we walked out I really wanted to turn around and go sing for myself but, I was too scared so, I shut my mouth and walked away. Later, that night I had "I Fall To Pieces" stuck in my head I couldnt get it out so as soon as I got home I bought a Patsy CD so I could here it. As I listened to that CD something changed inside of me. I wanted more than ever and lose my stage fright and sing and so with the help of Patsy I sang everyday and then finally I sang for my chorus teacher....and was given the lead role in the school musical (which lead to a hugh solo in chorus class) and suddenly I knew this was my destiny, all thanks to Patsy Cline. But, Patsy and me have a very sad connection, our fathers had both left us as children. I bet Patsy knew the same kind of pain I always feel when Fathers day rolls around, I bet shes cried on such a day too. Patsy Cline is my hero, she has made me who I am. She has helped me more than anything and any person could ever say they have. Her voice is like heaven on a record, No wonder she left so soon, heavens choir proubly seemed very empty without her, just like our world does now. Patsy Cline, was never perfect and she was a human being just like Dottie West said "Patsy was a real star, People can't get enough of a real star." and that is what Patsy Cline means to me. I know what it's like to be in your shoes. I used to be the youngest one on these forums- I'd be at patsy.nu or patsified.com every time I got my hands on a computer that had internet! People were always amazed at my obsession with PC since before I could talk. And when I did start to talk, I didn't shut up about Patsy Cline until I was much older. I'd even ask strangers if they "knew who Patsy Cline was." LOL. Phillips said he considers his albums old friends, noting he doesn’t put much thought into their worth beyond the nostalgia and the feeling of being surrounded by familiar faces and voices. “These are people – like Dwight Yoakam, John Prine, Patsy Cline – that have told me parts of their life story,” he said. From ABBA to ZZ Top, if they’ve recorded an album, chances are John Phillips has it. The Midland man is what one would describe as a consummate collector, with more than 30,000 albums taking up nearly every nook and cranny – even an old refrigerator – in his quaint home. "Her voice is like heaven on a record, No wonder she left so soon, heavens choir proubly seemed very empty without her, just like our world does now." I most definitely agree with that statement. What a shame she didn't live longer. Patsy Cline and Owen Bradley a genius pairing! What an amazing gift they gave the world!